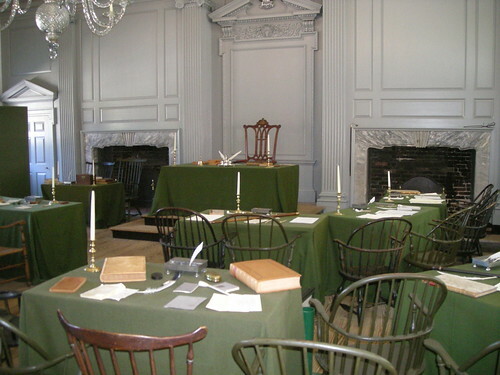 Assembly Room, Independence Hall - the room in which the Declaration of Independence was adopted on July 4, 1776. Although you need a timed ticket to enter, the tickets are free, and can be picked up at Independence Visitor Center, at 6th and Market Streets. There are a surprisingly high number, of Free Places to Visit in Philadelphia - including the two most famous attractions, the Liberty Bell and Independence Hall. But there are some less famous ones, which are equally cool to tour. This page is your guide to free things to do in Philadelphia, ranging from the universally-known Old City attractions, to less high-profile attractions that can be equally rewarding - and far less crowded. Your travel to Philadelphia does not need to break the bank. Hopefully, this page will provide some guidance. Here is a very partial guide, to free places to visit in Philadelphia. This page (and site) is still under construction, so this will be covered in more detail as Enjoying Philadelphia continues to grow and expand. The Chinatown Philadelphia Friendship Gate was constructed by highly skilled Chinese artisans in 1984, and renovated and refurbished in 2008. It is the largest authentic Chinese Gate in the world, outside of China itself, and the first built in the United States. Laurel Hill Cemetery, an idyllic, historic, Victorian 78-acre cemetery in the city's East Falls section, three miles north of the Benjamin Franklin Parkway, offers free admission at all times (except for special events). Founded in 1836, Laurel Hill is also celebrating its 150th Anniversary in 2010. If you'd like to leave Free Places to Visit in Philadelphia, and return to the home page of Enjoying Philadelphia, please click here.